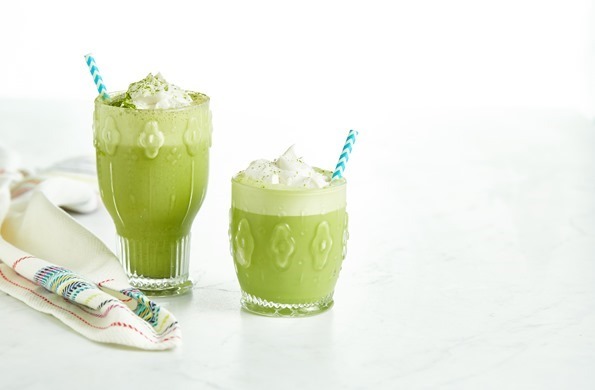 This is a fun way to get a healthy matcha fix even if the temperature is getting a little cooler. Rather than using regular ice cubes (which tend to water down lattes), I like to keep a stock of almond milk ice cubes on hand. Blending a couple almond milk cubes into this latte ensures it gets cold without the flavour being compromised! Vanilla bean adds a gourmet feel to an already luxurious cold drink. * I like to keep pure vanilla bean powder on hand, so it’s super quick to add a quarter teaspoon into the blender for a decadent vanilla flavour. If you don’t have any vanilla beans or powder on hand, not to worry! You can use vanilla almond milk and/or a half teaspoon of pure vanilla extract in a pinch.